Many people - black and white, men and women - contributed to the campaigns that eventually led to the abolition of the British slave trade (1807) and to the emancipation of the slaves already in the Caribbean (1833). These movements are, however, particularly associated with the name of William Wilberforce (1759-1833). Following his conversion to evangelical Christianity in 1785, Wilberforce believed that God had called him to two great causes to which he committed the rest of his life, the suppression of the slave trade and the ‘reformation of manners’. As an MP and a close friend of the prime minister, William Pitt, he was ideally placed both to exert influence where it counted, and to understand the political obstacle course that had to be negotiated. The campaign against the slave trade took twenty years to bear fruit. It was delayed particularly by the outbreak of war with France in 1793, which made parliament nervous about making a potentially economically destabilizing change. Nor was the eventual legislation in 1807 prohibiting the use of British ships for the slave trade the end of the matter. Ships of other nations could still trade slaves, and nothing was done to change the situation of those already enslaved, although Wilberforce and other abolitionists hoped – vainly as it turned out – that cutting off the supply of new slaves would force plantation owners in the West Indies to treat their existing slaves better. Hence Wilberforce continued his campaigns, notably with efforts to get a more general abolition of the slave trade, and subsequently in the 1820s initiating the movement to get slavery itself abolished. Due to age and poor health, he then passed on parliamentary leadership to Thomas Fowell Buxton (1786-1845), but on his death bed heard of the passing of the Emancipation bill in by the House of Commons. Meanwhile, although Wilberforce’s aspiration for the ‘reformation of manners’ was less focused, it was nevertheless a stimulus to significant endeavours at home. He was himself involved in a variety of philanthropic endeavours to improve the moral and material condition of the working classes in Britain. He was, however, criticised for his failure to commit the same passion to the cause of ‘white slaves’ in the growing industrial towns of his own Yorkshire constituency as he gave to that of black slaves in the Caribbean. Subsequently factory reform was a cause taken up enthusiastically by younger men who shared Wilberforce’s commitment to evangelical Christianity, notably Michael Sadler (1780-1835), Richard Oastler (1789-1861) and Anthony Ashley-Cooper, later Earl of Shaftesbury (1801-85). Their greatest triumph was the Ten Hours Act of 1847, which by placing legal limits on the hours that could be worked by women and children, freed them from the worst excesses of exploitation. Nevertheless, just as the terms of the slavery emancipation act of 1833, which compensated the enslavers rather than the enslaved, left an abiding legacy of injustice, even the best efforts of Victorian reformers could not eliminate all the oppressive aspects of the factory system at home. When discussing the abolition of slavery, and the abolitionists that worked tirelessly and sacrificially to bring about its end, one seldom if ever hears about the significant part Africans played in securing their own freedom. 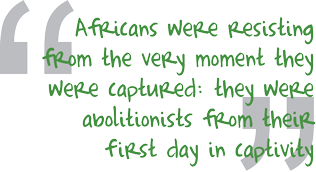 The truth of the matter is that Africans were resisting from the very moment they were captured: they were abolitionists from their first day in captivity. We all know of the work of William Wilberforce and the “Clapham Sect”, Granville Sharp, Benjamin Lundy, Hannah More and others, names that trip easily off the tongue, but what of the affected people themselves, what were they doing? The answer to that question is everything humanely possible, both slaves and so called “free blacks” were at the frontline of the liberation struggle, they would do whatever it took to bring about the amelioration of their condition. Of course some names of black abolitionists like the great Frederick Douglass, (Feb. 1818 – Feb. 20, 1895), Henry Highland Garnett (Dec. 23, 1815 – Feb. 13, 1882) and Martin Robison Delany (May 6, 1812 – Jan. 24, 1885) are more widely known than others, yet not given the reverence they deserve. Martin Delany ​for example is considered to be the grandfather of Black nationalism., and was among the first three black men or women to study at Harvard Medical School, however white students had a petition demanding that they not be accepted, and they were not. Delaney also worked alongside Frederick Douglass to publish the North Star and was active in recruiting blacks for the United States Coloured Troops, for which he was commissioned as a major, the first African-American field officer in the United States Army during the American Civil War. He was politically active and also a prolific writer of pamphlets, articles and books. His response to Harriet Beecher Stowes’s Uncle Tom’s Cabin, called The Huts of America, the first novel by a black man to be published in the United States, portrayed the journey of a black insurrectionist’s travels through slave communities. He was of the opinion that Stowe’s novel had portrayed slaves as too passive and weak, he did however praise her for highlighting the cruelty of southern slave holders. Delaney was indicative of the black abolitionists, in that he wasn’t asking for freedom or meekly petitioning for it, but demanding it! In this there is no doubt that he would have benefitted from the work of a predecessor, David Walker. Walker a free black man, whose pamphlet “The Appeal” was considered to be the most incendiary anti slave narrative in the history of the United States, the tone of which was a cocktail of moral ethics and messianic deliverance, had laid the foundation and influence for future civil rights activists in the 20th century. Add to the pantheon of “Great Abolitionists”, the names of Gabriel Prosser, Samuel Cornish, Sojourner Truth, Harriet Tubman, Charles Henry Langston, Harriet Jacobs, John P. Parker and many others too numerous for the scope of this paper.